6 weeks after being born, Einstein moved to Munich, and began schooling at Luitpold Gymnasium, then to Italy to continue his education, and then in Switzerland’s Federal Polytechnic School in Zurich, training as a physics and maths teacher. In 1901, he gained his diploma, and unable to find a teaching post, he accepted a position as the technical assistant at the Swiss Patent Office. In 1905, he obtained his doctorate degree. Whilst at the patent office, he had much spare time, and during this time, produced some remarkable work. This led to his eventual appointment of professor of Zurich in 1909, and then professor of Berlin in 1911. In 1914, Einstein renounced his German citizenship for political reasons (namely, World War I which began summer of 1914), subsequently migrated to America to become Professor of Theoretical Physics at Princeton University. 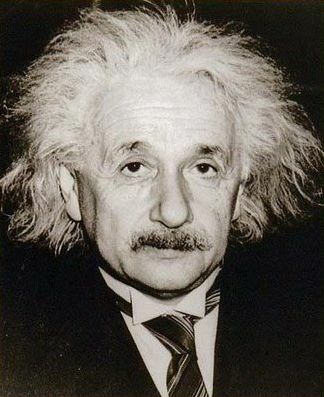 In 1940, Einstein fin[ally became a citizen of the United States, before retiring as Professor in 1945. Prof Albert Einstein was distinguished because of the way he analysed physics problems. He approached them with a determination to solve, and with a strategy to visualize his goals. Einstein regarded major achievements as stepping-stones, looking beyond the past into the future. Realizing that Newtonian mechanics was inadequate, Einstein formulated the theory of relativity, which aimed at reconciling the classical laws of mechanics and the modern quantum theory. In fact, the theory of relativity was postulated in Einstein’s early days, published in 1916, shortly after Einstein moved to the United States. One of Einstein’s most famous formulas was , where E is energy, m is mass, and C is the speed of light (which remains constant at ). To figure out what number 3*108m/s is, we can out-multiply 108, essentially writing 1, with 8 zeros after, namely 100,000,000. Since we have 3*, we have 300,000,000. As the formula uses , this would be , which is . To solve the second part, we simply multiply the powers, so that is 9*1016. This number is 9 with 16 zeros after, or . Using the long scale, noting that this is not used in most English-speaking countries, the aforementioned number is or 90,000 billion or ninety thousand billion. The SI (standard internationale) units used in is joules for Energy, kilograms for mass, and m/s for the speed of light. As the speed of light (c) is constant, we can work out the energy for any mass (m). This means a small mass could produce an amazingly large amount of energy.